Today’s digital environment may make some businesses hesitant to run newspaper ads. And the doubts are understandable, except when you realize that advertising in newspapers still gets results. There are very recent studies that show this to be true. And the success of our own clients at Macromark has also proven that newspaper ads are still a viable medium for marketing. There are reasons why, despite the rise of digital platforms, ads in newspapers are still attractive and still get results. Research by Target Group Index (TGI) has shown that more attention is paid to newspaper ads by over 50% of mass market readers. About the same percentage of readers turns to the newspapers to get their news coverage. And when you consider that approximately 2.7 billion adults are still reading newspapers, the potential for advertising success looks a lot more likely. This is a fact that should make you excited as a marketer. People who read newspapers have committed to paying for that service. You can fairly assume that because they are paying, readers will be more attentive to all of the content, including the advertising. You have to be careful, however, because you can also assume that they will be more critical. Make sure the messaging in your copy is on point, especially if you are using something like an advertorial. A recent survey conducted by WAN-IFRA showed that 92% of all newspaper revenue is still generated by print. Although digital is starting to make a dent with readership, print is where the money currently lies. And if that’s the case, your money should be in the same place. Looking at these statistics, it becomes clear that advertising in newspapers is still relevant. Of course, this is dependent on your demographic and your product, but the applications are far more widespread than marketers may recognize. Macromark has had considerable success in helping our clients capitalize on this space. We understand how the newspaper industry works with respect to advertising, and have used our knowledge to help our clients engage with their consumers at high rates. 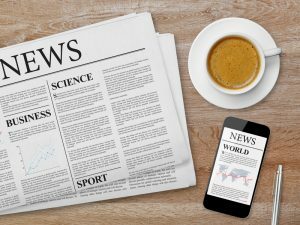 If you are considering advertising in newspapers and have questions, contact us now. We’ll be able to break down all of the pros and cons of this platform and determine ways your business can be successful in this space.